Goat cheese is being used in the kitchens of some of the most famous restaurant in the U.S., as Americans have enthusiastically embraced the taste of goat cheese in their favorite dishes, including pizza, ravioli, sauces, and appetizers. Fresh goat cheese also pairs wonderfully with the local wines and microbrews. Everyday, more and more people discover the delights of goat cheese, thus continuing the demand for it. Goat cheese (Chevre cheese) can be found in many varieties, packed in various shapes and sizes, and varying in texture and taste. Fresh goat cheese should look moist. Reject if air-bloated, moldy, or leaking whey. 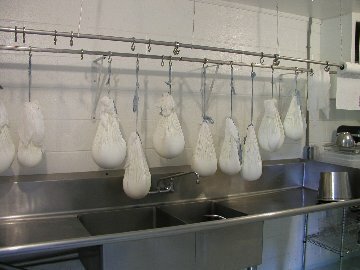 Goat cheese hanging to drain off the wheys. Fresh artisan goat cheeses are not usually aged, so they are fresh and creamy looking with a fairly mild, salty flavor. To store, you need to protect the cheese from air with the original wrappings, plastic wrap, or wax paper. 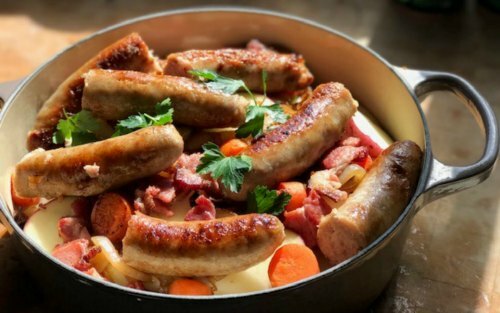 Remove from refrigerator one hour before serving. Discard any cheese that develops an off-odor, strange colors, or more than a touch of mold. For longer storage, freeze your goat cheese. The cheese can be frozen in small packages (in quantities of one pound or less). As long as the cheese is in good condition and tightly wrapped, its flavor, texture, and moisture content will remain unchanged. Thaw goat cheese slowly. Leave it undisturbed in the refrigerator for a period of 24 to 48 hours. Whatever you do, let the cheese warm to at least to room temperature before serving to maximize the flavor. All goat cheeses are heat sensitive and can becomes grainy and separate when overheated. When using in recipes, heat until just melted. .
To purchase Goat Cheese, check out what’s Cooking America’s Cooking Store. When compared to cow’s milk products like cream cheese, goat cheese is lower in fat, calories and cholesterol. It also provides more calcium and fewer carbohydrates than cream cheese. Even though goat cheese has less calories, it has a full, rich and creamy flavor. Goat cheeses are easier to digest than cow’s milk cheeses because the fat cells are smaller, thereby more closely resembling human milk. This also allows the fat to be broken down and more easily assimilated. Many people who are lactose intolerant or have other milk-related allergies can eat cheeses made from goat milk. To freeze goat cheese, leave cheese in its original packaging. If it have been already opened, wrap tightly in plastic wrap. then overwrap with more plastic wrap or heavy-duty aluminum foil, and place it into a heavy-duty freezer bag. When you are ready to use the cheese, thaw it slowly, preferably in the refrigerator overnight. For best flavor, use frozen cheese within a couple of months. Spread on toast or bagels. Swirl or layer with pesto to spread on crackers. Top green salads with crumbled cheese, or with slices briefly warmed in the oven. Use goat cheese in lasagna. For a simple pasta sauce, mix goat cheese with pesto. Slice goat cheese, warm in the oven, arrange in a pool of chocolate sauce on a dessert plate, and sprinkle with chopped nuts. Use in place of sour cream on baked potatoes. Arrange whole or sliced plain goat cheese on a serving plate. Sprinkle with fresh or dried herbs of your choice and drizzle with extra-virgin olive oil or vinaigrette. Serve with crackers or bread. Place two whole or split a 5-ounce goat cheese round in a pint jar. Add garlic, cloves, parsley, a few peppercorns, a spring of thyme, and 1/2 of a bay leaf. Cover all with extra-virgin olive oil and let sit for a few days. Serve with crackers or bread.